Halifax RUFC clinched promotion to Yorkshire Three in style yesterday with a 48-0 win over relegation fighters Sheffield Oaks at Ovenden Park. Only a bonus point was needed to clinch second place behind Wetherby but Halifax were determined to put on a show for the home supporters. They eventually did that, playing with more freedom once man of the match Tony Curtis had scored their fourth try just after the break. 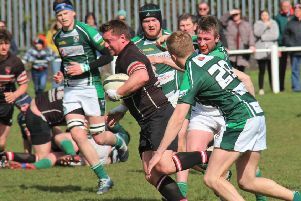 The blind side flanker scored two tries while open side Andy Harris was also outstanding and crossed the whitewash. The game started at a good pace with Oaks showing they meant business, but the conditions meant that Halifax’s running rugby looked sure to pay dividends. They took the lead after eight minutes when a set move released Elliot Mercer to cross for an unconverted try. Constant pressure produced a second try, scored by Toby Turner and converted by captain Richard Cole. Oaks then picked up their game and had a spell on attack until a turnover gave Halifax the opportunity to link forwards and backs and Jack Ryan’s score made it 19-0 at half time. It was mission accomplished soon after the restart when Curtis scored from a rolling maul. Joe Gallagher showed flair and panache to run the length of the pitch to score and Harris went over for a well-executed try. Curtis’s long-range dash and Gallagher’s easy goal put more daylight between the teams and Cole’s last-minute try wrapped things up. Player-coach Giles Hetherington was delighted the side had achieved its main goal during his first season in charge. He said: “We got what we expected from Sheffield Oaks - a difficult test. It was a final appearance for king-sized prop Dean Cotton, who is retiring, but Halifax’s season isn’t quite over. Hetherington said it looked as if Halifax would have to make a second attempt to play their game against Wensleydale at Leyburn next week. They got as far as Wetherby eight days ago before the coach suffered a flat tyre which could not be quickly repaired. Fellow Yorkshire Four side Halifax Vandals finished their season with a fourth successive win, beating visitors Mosborough 24-12. The Warley men went above the South Yorkshire side in the table and have finished a much-improved sixth under Jamie Bloem.